The Municipality of Tweed would like to congratulate the Friends of the Tweed Public Library and the Library for their success in securing grant funding and acknowledge a year full of exciting programming opportunities! Friends of the Tweed Public Library received funding from the Canada Council for the Arts to host a Writer's Series throughout 2012. "We had a really good crowd for Terry Fallis on April 19th, people came from all over the region to meet, get their books signed, and enjoy some refreshments," said Cathy Anderson, Librarian. "The Library has special presentations throughout the year," noted Amy McDonald, Program Developer. "Kevin Callen is coming on May 8th to present his new film "Wilderness Quest, the 1000 Island Playhouse Company will perform 1812 & All That on May 19th, and more to be announced. We have weekly programming at the Tweed Public Library too; a Pre-School Craft and Story time from 10:30-11:30am on Tue, Thursday night is Wacky WII night from 5-6pm, and Saturday Morning Cartoons and Crafts from 11am-1pm. All programs and events are open to the public so come out and see what is happening," encourages McDonald. 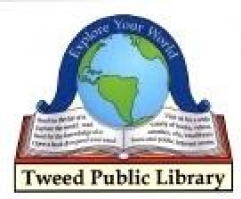 In addition the Tweed Public Library has a large selection of resources available. With your library card you can research their on-line resource databases, view reference materials such as dictionary, thesaurus, atlas, encyclopedias and much more! You can also check out their online catalogue and even use a form to "Ask a Librarian" Just recently the Library received another grant for seniors to teach art to youth. More information on the program will be available on their website soon. All Tweed Public Library programs and events are listed on the Coming Events section of the Municipality of Tweed website at www.twp.tweed.on.ca. For hours of operation, to obtain a membership, become a Friend of the Library, or Board Member, and for information about the Tweed Public Library visit their website at www.tweedlibrary.ca or contact them at 613-478-1066. For more information contact Joey Walsh, Economic Development Officer at walshj@twp.tweed.on.ca or 478-2535.